Many people choose to use one of the professional relocation agents to help them with every aspect of their move. Finding accommodation in London can be the most stressful part of moving to London. Letting someone else handle the hassle is a great of being able to enjoy the city when you arrive. This weekend has a host of events and activities happening. Even the recent public disturbances will not affect the way that Londoners enjoy the last weeks of summer sunshine. The Canary Wharf Jazz Festival is being held at Canada Square Park this weekend. (12 – 14 August 2011) It is a free celebration of different types of jazz and music and is one of the highlights of the summer social scene. Even if you’re not mad about Jazz you can enjoy the afternoons and early evening in the outstanding outdoor venue. There are no reservations for the festival and sometimes it can be quite a crush for the premium acts and performances. If you want make sure you find a space, then get there early during the day. You are not allowed to bring glasses and bottles into the venue. 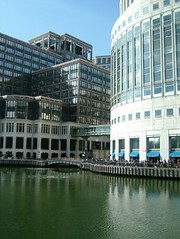 Canary Wharf is an important and is one of the areas that have seen most development during the past decade. What was once a dingy dockland is now one of the most expensive and desirable addresses in the entire city. Canary Wharf brings modern design and architecture into the very heart land of traditional London. Your relocation should be about grabbing every opportunity to explore different areas of the city and discover the wealth of culture and diversity that you new home is all about.